It should have been Pep Guardiola’s masterpiece as Bayern coach: After the 0-1 in the first leg against Real Madrid, Bayern needed a win to still reach the Champions League final. Guardiola made a personnel change and brought Thomas Müller on for Rafinha. Bayern played a 4-2-3-1, with Lahm taking over the right-back position. Real coach Carlo Ancelotti brought in Bale for Isco, but stuck mostly to his slightly asymmetrical 4-4-2. Bayern were obviously trying to avoid the mistakes of the first leg . In Madrid, they could not capitalize on their chances in possession and were too easily pushed towards the wings. As a ten, Müller brought more presence to the offensive center. The wingers were also flexible and moved frequently into the half-spaces. During buildup out of his own half a winger would always shift into the half-space and act as a kind of second eight next to each advanced midfielder. Bayern tried to alternate quick combinations through the narrow middle with wide attacks down the flanks. If the ball was on the wing, the full-back ran back and forth at high speeds to provide dynamism. There were also occasional attempts at overloads, such as when Ribery was on the right side and Robben supported. Last but not least, Bayern increased their presence in the penalty box. In the first leg Mandzukic was often alone in the box. Müller and especially Schweinsteiger now got forward more often and popped up in the opposing penalty area. Kroos, however, remained in the background, waiting for layoffs. These adjustments were all useful after the possession in the first leg rarely amounted to anything. However, the flip side of the coin was that Bayern gave up a certain amount of control over the game. The focus on faster combinations and earlier shots ensured that the game had a more open feel than the first leg. Ribery gets to a switched ball and immediately begins dribbling without the attack properly prepared – most of Bayern’s players are to the right. There is no supporting player on his side (Alaba was pulled inwards). Surrounded by three men he ultimately loses the ball to Bale via a bad pass. Bayern can’t counter press as the players are mostly behind Bale. Also interesting: Not Kroos, but Schweinsteiger goes to counter press Bale. Real plays the counterattack perfectly and scores in just eleven seconds from their own penalty area. This was often the case with good approaches, even with the combinations through the narrowness of Real. Mandzukic tried to be more involved in the passing game than in recent weeks and had some good layoffs. Nevertheless, one combination or the other came to no end for the striker, whose passing skill is not among his strengths. The Bavarians were therefore unable to bypass the extremely narrow center of the Merengues (see below). Another weakness of Bayern was the suboptimal protection against the counter. 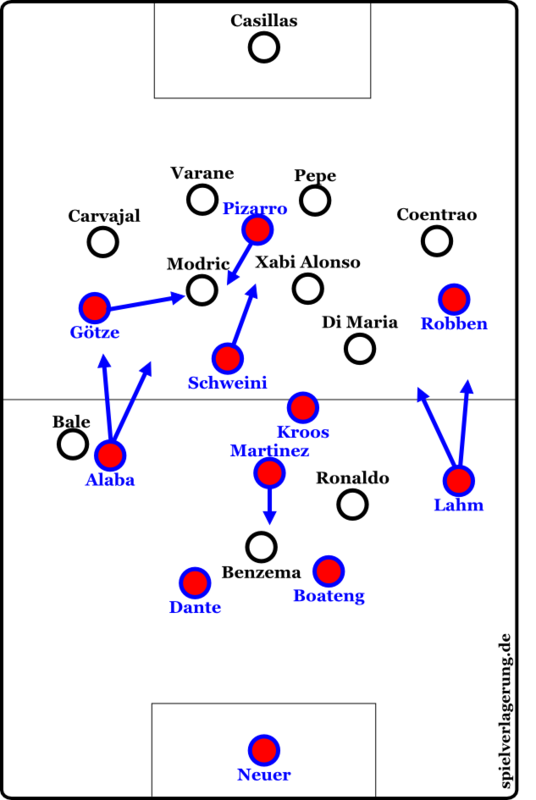 While in the first leg the three-man midfield of Lahm-Schweinsteiger-Kroos dominated the center and pushed Madrid wide early on, Real found it easier to initiate counter-attacks through the middle. Because of Schweinsteiger’s advances and Muller’s higher role, Kroos had to cover a large portion of the field alone (which he didn’t handle very cleverly). Real kept trying to get into the half-spaces by Ronaldo falling back or di Maria pushing forward. Ronaldo’s falling back could be neutralized by Boateng or Lahm man marking him, leaving him no time on the ball; however, di Maria’s advances could not. In the aforementioned 0:3 goal it was di Maria who came forward into the free half-space and initiated the counter. With all the analysis of the Munich tactics I don’t want to forget that football is a game of two teams and Real Madrid put forth an extremely strong performance. In comparison with the first leg they tripled their effort. In that game they interpreted their alignment slightly more passively and there was rarely a move forwards. In this game their defense worked even better. They retreated together even more closely when Bayern played the ball into the center and they moved out consistently when the Bavarians sought a back pass. They changed several times to a 4-3-3-Pressing, where Ronaldo went to the left and Bale moved forward. On goal kicks they lined up consistently in an almost diamond-like formation with the full-backs advancing and challenging for the ball. The man marking worked extremely well on the wing, especially on the right side: Carvajal moved up to a certain limit if Ribery fell back, while Bale pursued the runs of Alaba, even if he moved inward. Bale’s defensive effort was enormous. In the first few minutes it seemed as though the Bavarians wanted to increasingly attack on the left side and take advantage of any defensive weakness from Bale. But Munich gave up on this after a few minutes (and some really strong tackles by Bale). Also, Madrid’s counterattacks were just a bit more precise than in the first leg. At first Ronaldo often dropped back and was heavily defended by Boateng, but the Portuguese took over the sprints in deep after a while. Benzema, however, moved intelligently to the wings and lured out the Munich central defender. This not only created space for Ronaldo, but also for the onrushing midfielder. His movement also took care of the 3-0 goal – he opened the space for the advancing Bale. One must say that the game was largely balanced until the first two goals; Bayern were not so hectic in their actions, Real’s counter machine wasn’t up and running. The first two goals were scored from set pieces and there were no gross tactical errors. The set pieces were difficult to defend as they were perfectly executed. Opponents of zonal marking will blame the coverage but the fault with the 0:1 goal was actually in the detail, as Boateng was man marking and triggered a chain reaction, in the end just lacking the crucial inches. By contrast, the 2-0 was a perfect variant to distort a zone defense. Pepe’s flick on to Ramos beat the mass of Bayern players in the center of the box. A brief psychological tactics digression: The Merengues responded excellently to the first goal. They immediately pushed further forward and attacked earlier to not let Bayern get back into the game. They also suppressed a change of momentum by their clear, but by no means unfair, time-wasting. Four gross minutes lay between the two goals, which Real reduced to only 42 seconds of net playing time thanks to some free kicks and a throw-in. The 2-0 goal decided the game. Many of the negative aspects of the Bayern game, especially the hurried nature of their attacks, clearly came to the fore. During the break Guardiola tried to stabilize his team via the substitution of Javi Martinez (for Mandzukic). Martinez acted as a nominal six, but usually dropped off and became the central part of a back three. Lahm and Alaba pushed significantly further forward and even Schweinsteiger was so high that he was almost a ten. This structure worked better than that of the first half, however, it’s difficult to assess with a score of 0:3. Martinez made for a better safeguard against the counterattack, but Real played their attacks without as much verve and intensity. The Bavarians, however, controlled the ball better at the back than before the break, but continued with the wing moves of the first half. This obviously worked worse without Mandzukic on the field to get on the end of crosses. Finally, Pizarro and Götze were allowed to sniff Champions League air. Götze showed some strong movements and positioning in the intermediate line space, but was not involved by his colleagues, who now seemed physically and mentally tired. Before the end, Real increased the score to 4-0 – the final humiliation for the proud Bayern. Real Madrid fully deserved to beat Bayern. So did Pep Guardiola’s philosophy fail? It’s a resounding no in my view. Unfortunately, in Germany the philosophy is always questioned first instead of carefully examining the errors in detail (see also the discussion after the German em-semi-final). In modern football it’s rarely about the big picture, but the small details. This game wasn’t about a possession-based team losing out to a counter attacking team but a poorly configured team falling to a better laid out team. Real played their game plan mercilessly and with near-perfect efficiency. Bayern did not. Pep Guardiola’s attempt to combine the close game (Müller) and the wide game with crosses (Mandzukic) failed. Not in a big way – the game was balanced prior to the first two goals. But they lacked that something extra in the final third to break down Real Madrid’s magnificent defense. Pep Guardiola also abandoned the defensive stability of the first leg by swapping Müller for Rafinha, which had a negative effect on their control of the game. It is only the first major defeat for Guardiola at Bayern. He will go back to the drawing board and try to return with a better tiki taka.